For Immediate Release – July 30, 2018 – Oklahoma City, Oklahoma – After a successful weekend at a number of National Reining Horse Association (NRHA) approved events, another stallion has crossed a historic NRHA milestone. With offspring earning more than $22,000, Smart Spook is unofficially an NRHA Five Million Dollar Sire. Smart Spook is a 17-year-old stallion by NRHA Six Million Dollar Sire and Hall of Fame inductee Smart Chic Olena and out of Sugarplum Spook. 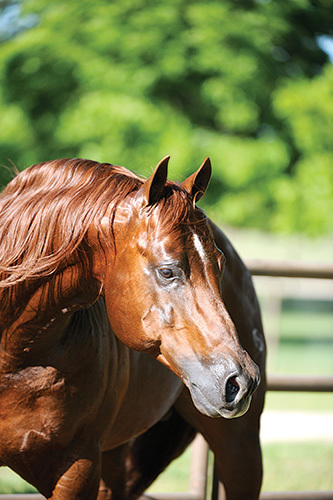 Owned and bred by Rosanne Sternberg, the sorrel stallion stands at Sterling Ranch in Aubrey, Texas and was inducted into the NRHA Hall of Fame in 2015. The stallion’s first class of money earning offspring was foaled in 2006. Since then, the sire has produced eight foals with more than $100,000 in NRHA LTE in addition to five NRHA Futurity Champions and one NRHA Derby Champion. Helping the notable sire cross the five million dollar mark were great performances by his offspring at the 2018 NRHA European Futurity, the 2018 One HOT Reining – One HOT Summer Slide, and the 2018 Reining by the Bay, where Luca Fappani rode Spooks N Jewels (out of Whiz Jewels, owned by Andrea and Tish Fappani) to more than $22,500 in earnings.